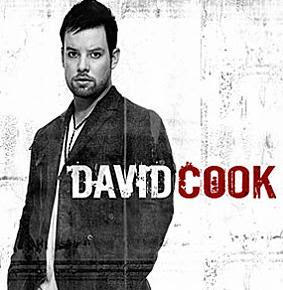 Here is the album cover of the latest American Idol winner David Cook. His self-titled album will be available on record bars this November 18, 2008. His current single "Light On" was recently released on radio and wasn't picking any good raves. On the other hand, David Archuleta's single Crush has the better first single. The battle is still on for both American Idol David's. David Cook's single debuted on Billboard at #15 and I cannot see his song at the top 50. David Archuleta's single on the other hand debuted at #2 and at #22 this week. Now, who should be the American Idol winner? Oh Creepy boy is only doing better because the teeny bopper girls are buying his cd. In the long run David C is the one who'll tough it out and show he deserves to have won. Of course, even with me being 39 i'd pretty much just like to lick David C's face so i could be a little biased lol. This is first time I know David Cook.